Race and racism have become huge areas of study in the social sciences over the past two decades. However, whilst this has been reflected in the growing body of theoretical and empirically based work, surprisingly little has been published that explores the methodological and practical issues involved in researching race. 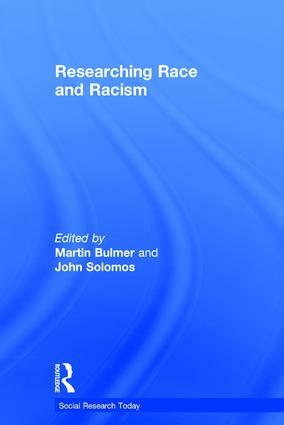 In Researching Race and Racism Martin Bulmer and John Solomos have brought together contributions from some of the leading researchers in the field, using the benefit of their experience to explore the practical and ethical issues involved in doing research in this sometimes controversial, often heavily politicised field. This book will provide students and researchers - both new to the field and experienced alike - with an invaluable tool to help them find their way. 1. Introduction 2. Researching Race and Racism: French Social Sciences and International Debates 3. Framing the Field 4. Race, A Word Too Much ? The French Dilemma 5.Researching 'Mixed Race' Experience Under Slavery: Concepts, Methods and Data 6. Researching Whiteness 7. Naming the Unnamable, Questioning the Unquestionable 8. Trust, Fiction and Ethnography: [Re}Writing the Asian Gang 9. Racial Orthodoxies: Research, Ethics and Minority Groups 10. Reflections on Fieldwork 11. The Study of Racist Events 12. The Study of Racist Events 13.Being Taught About Being Black/White and Working Class 14. Ethnic Options and Racial Identities 15. Insider or Outsider?